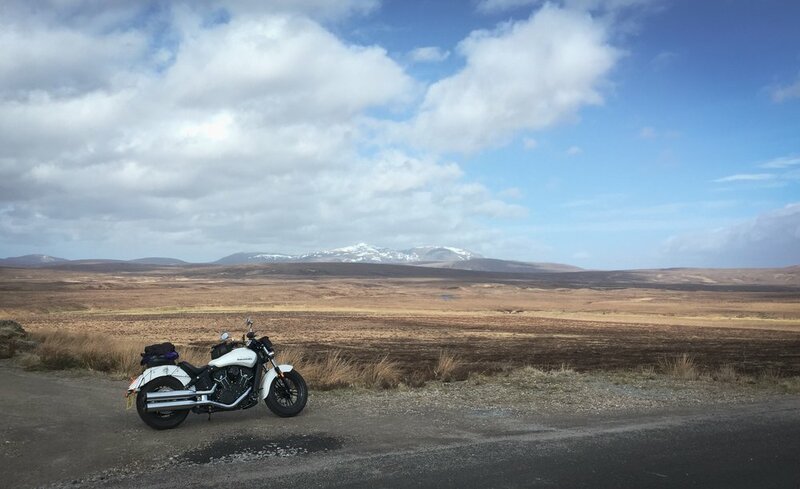 Ok, so John O’Groats may not actually be the most Northerly point on mainland Britain that you can ride to – that’s Dunnet Head 11 miles to the west/northwest – but JOG is still the classic long distance destination that should be on every motorcyclists check list. So when I had the opportunity to bunk off for 3 days during a visit to family in Edinburgh, it was a great chance to ride the relatively short hop up the East coast and put a tick in the box marked JOG...but the 3 days of clear and sunny weather and amazing roads made sure it was much more than just a box ticking exercise! If I’m honest, before this trip I’d always been slightly dismissive of heading to Scotland, preferring to hop over to Europe if I got the chance to string a few days together for a trip. 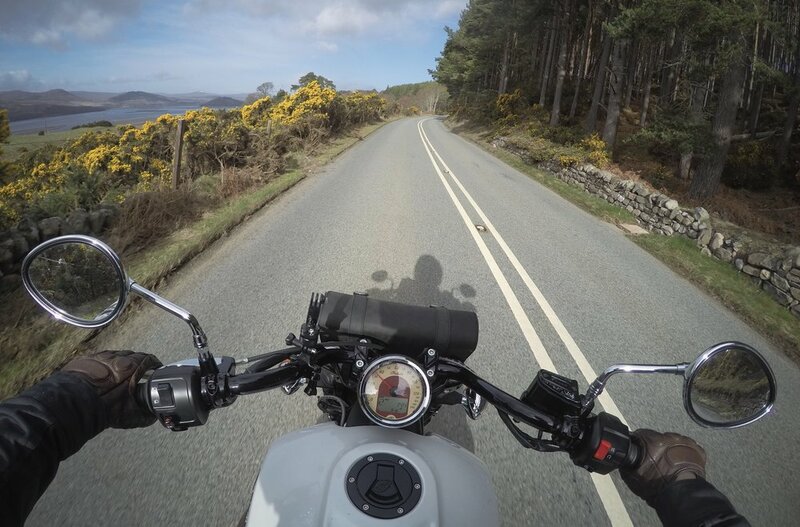 The North Coast 500 has consolidated and commercialised the route around the coast, linking places to stay and eat, and things to see along the way, but you can just have a quick look at Google and cobble together some roads and you won’t go far wrong. On the recommendation of an MCN chum I planned to head into the remote interior through Lairg, Altnaharra and up to Tongue before skirting round the coast to JOG on the NC500, and on the way back I also planned to take the highest public paved road in Britain, the A93 Old Military road up over the Cairngorms. 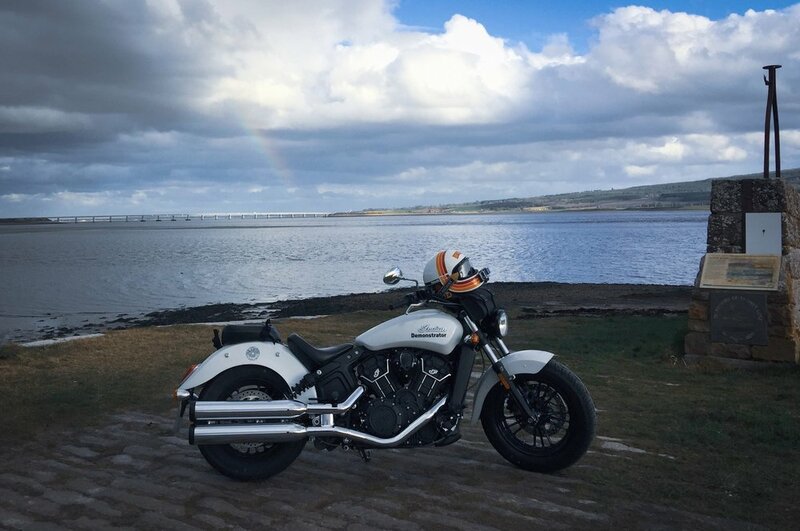 Having driven the 9 hours North to Edinburgh in the family wagon a few days earlier, I’d arranged to hire an Indian Scout Sixty from Saltire Motorcycles in E’burg. I’d recommend them – they were bang on and well-practiced with the tedious admin of pickup and drop off routines, and the showroom is one of those destination jobs which is well worth a nosey around. 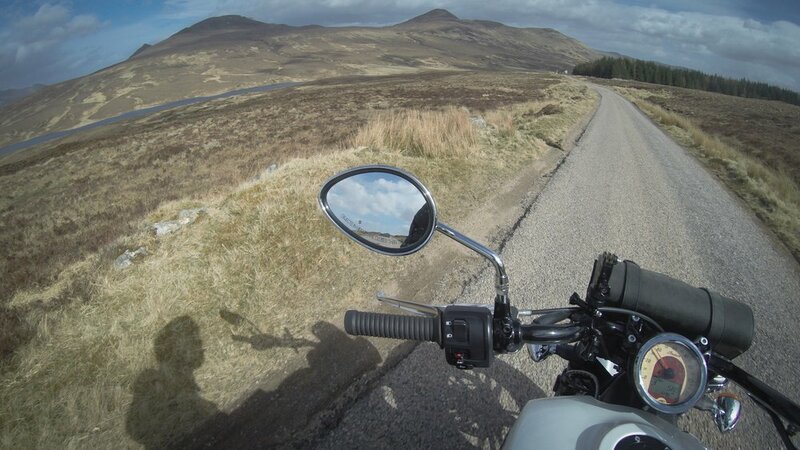 Being slightly nervous riding an unknown bike for the first time...and not a cheap one at that…I decided on the easiest route up to my base in Dornoch – straight up the M90 and then along up the A9. After a quick coffee at Bikers Cove in the shadow of the Forth Rail Bridge, I pointed the Scout’s fat front tyre North and rode over the recently opened Queensferry Crossing Bridge. 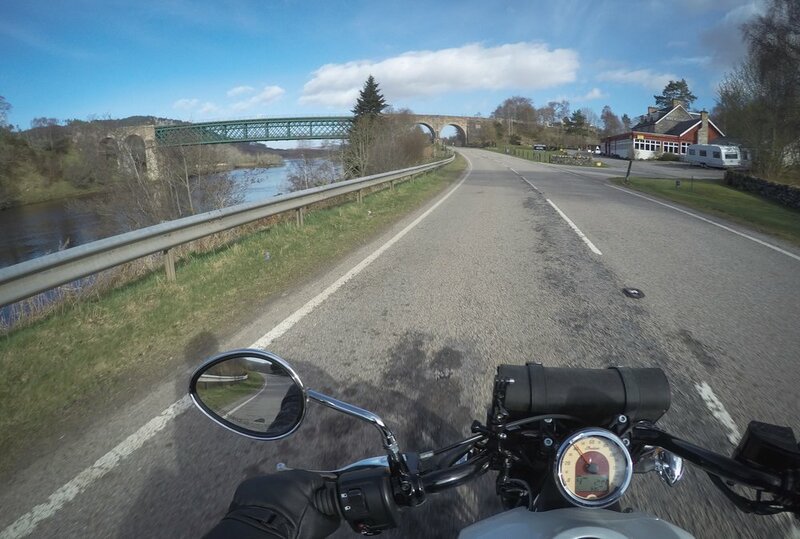 I love riding over bridges so that was nice…but the M90 and consequent A9 are heavy with HGV-Campervan-Caravan traffic, and actually a bit tedious. I checked in at Dornoch, where in 1727 Scotland’s last execution for Witchcraft took place and in 2000 Madonna got married, and headed out to explore. 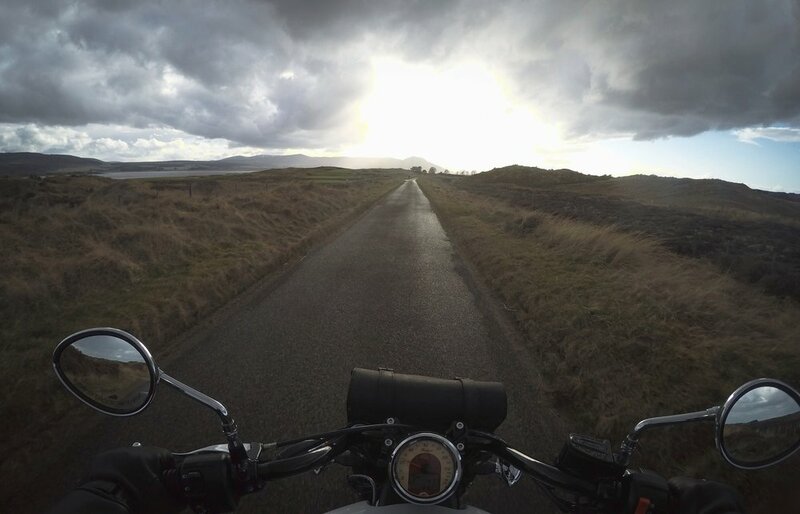 A quick ride down to the wide and empty Dornoch beach, back to the A9 and twice over the Dornoch Firth Bridge. Catching a glimpse of a small brown sign I dived off left down a narrow single track road to explore. Meikle Ferry Slipway was the only way to cross the Firth before the Bridge at Bonar was built in 1812. Deserted now, it was the site of a major disaster in 1809 when the ferry sank and 99 people lost their lives. A contemplative spot to watch the sunset over the Dornoch Firth and wonder where the 2 bolts that vibrated loose and dropped off the Scout had gone to. Up early and waterproofs strapped to the pillion pad…where they stayed untouched all day! Heading directly West towards Bonar Bridge in the morning sunshine was a lovely start in the day. The road winding alongside the Dornoch Firth on one side, and steeply banked pine forest on the other. Skirting North along the edge of the Kyle of Sutherland, past the imposing but modern Carbisdale Castle at Invershin, built as a divorce settlement. Leaving civilisation behind as I passed through Lairg, home of Europe’s largest one-day sheep sale, I headed North with Loch Shin at my back. The fast flowing, dipping and climbing A roads and wooded landscape changed quite suddenly to narrow single track winding across flat and open moorland. A quick photo stop at the Crask Inn, owned by the Church and described as Scotland’s most isolated Inn, and I can certainly believe it. Through Altnaharra and on to Tongue alongside the absolutely beautiful Loch Loyal, already tasting the sea in the air. A quick petrol stop in Tongue at an attended Mom and Pop pump alongside the village shop and post office. The sweet old lady handing me the pump with “I’ll let you do it”. After leaving Dornoch at 08:00 in the morning I finally got to JOG at 15:30. A quick coffee, a cheese scone and a slice of cheesecake and down to the sign post for the obligatory selfie with a Two Gun Salute Jerry Can sticker slapped on between New York and Lands End. All a bit of an anti-climax, but that box was well and truly ticked. 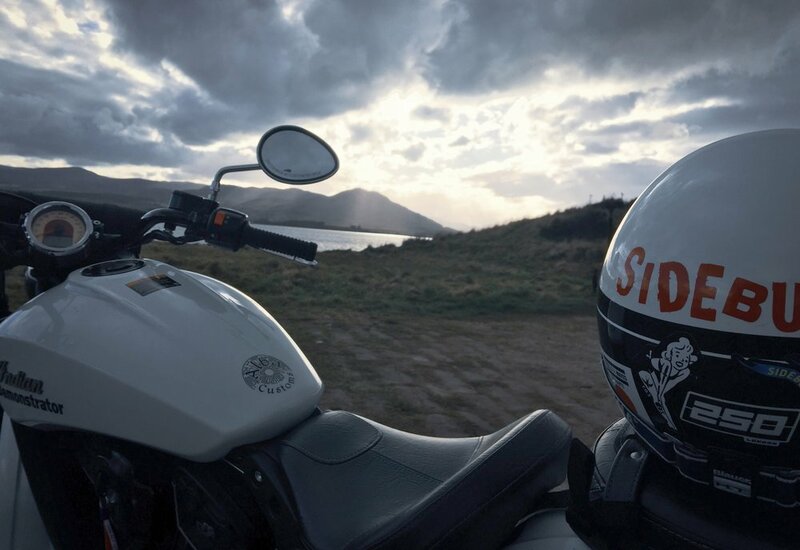 A quick chat to a Honda CX500 rider hopping over to the Orkney Isles and it was off again, heading South for the first time in two days. In Wick it was time for another petrol stop. 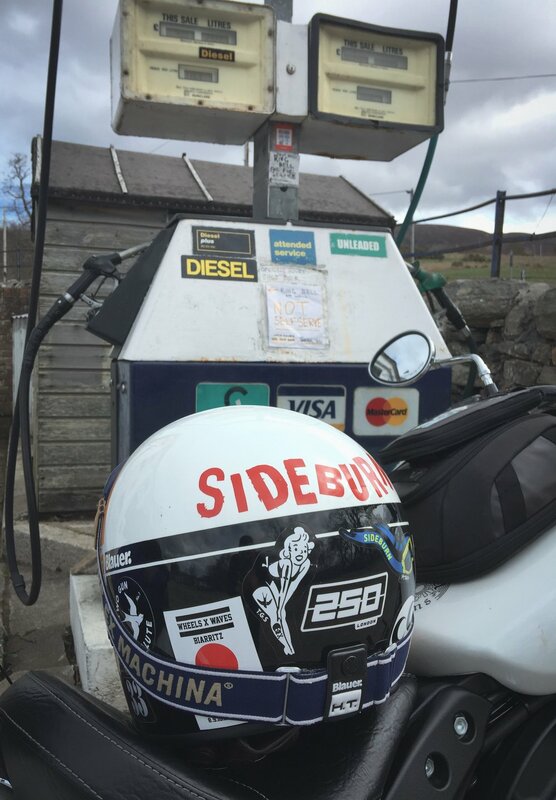 Passing through the rather run down town the giant hand painted Michelin man in a kilt on a garage wall and an abandoned fifties petrol station complete with vintage pumps tempted me to stop for photo’s, but the day was waning and I was knackered, still with 60 miles to go. Chatting to the owner of the coffee shop at JOG he had warned me of the “Alpine Pass” that is the Berriedale Braes, and sure enough once through Wick this was one of the highlights of the skim back down the East Coast, with the road dropping away dramatically with spectacular cliffs to the sea and several sharp switch backs. The grunt of the Scout made short work of the steep climb out. Finally arriving back into Dornoch at the end of a cracking day, lasagne and chips in the transport cafe on the A9 really hit the spot. With a target of 17:30 to return the bike in Edinburgh, it was a skipped breakfast and an early start. After cleaning off the Scouts saddle following a seagulls target practice it was a quick blast to Inverness and another petrol stop, before diverting from the A9 towards Nairn and heading off to Cawdor. A wrong turn landed me in the middle of a building site – Tornagrain is a strange, brand new town that has the feel of the Prisoner or the Avengers, the one with Peel and Steed, not Hulk and Ironman. Back on track and a quick stop at Cawdor for a coffee and a locally made meat pie then off to join the A939 to Grantown-on-Spey – what a road! 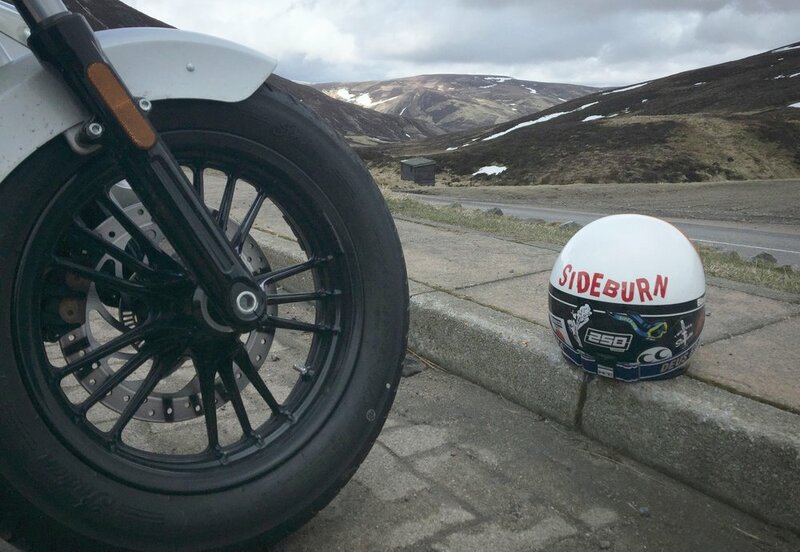 Maybe it was that fine meat pie that put me in a jolly mood, but cripes that road is an absolute belter - 25 of the best miles I’ve ever ridden on a motorcycle. Full stop. Period. A stretch of road to be revisited for sure. At Grantown-on-Spey, yet another little brown sign noting the Old Spey Bridge pulled me left instead of going straight, and a quick 2 minute ride along the river brought me to the old stone bridge. Completed in 1754 to carry the military road MR9 across the River Spey but closed to traffic for years, there was just enough of a gap to squeeze past the bollards and potter on for a few snaps. Getting back off required a 10 point shuffle with an on looking crowd of mountain bikers, and a hefty damage deposit loudly in mind. Paddling the rented Scout backwards and forwards on mossy 260 year old cobbles really got me sweating. 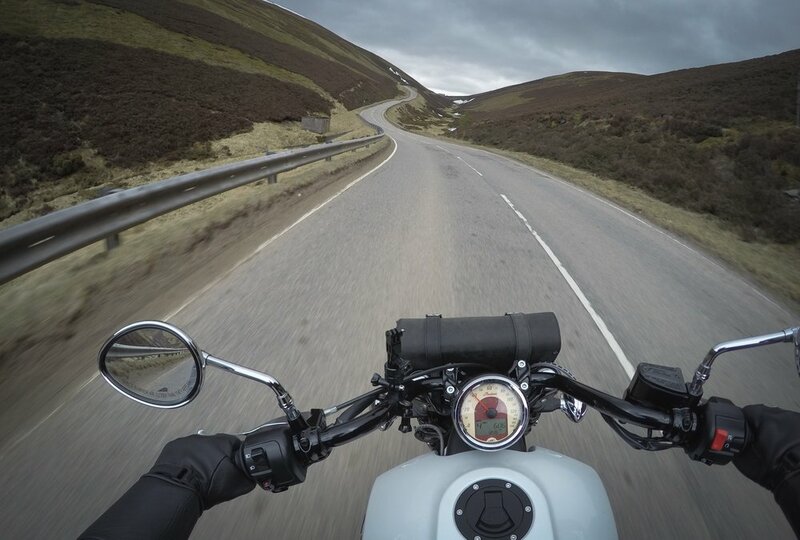 Back onto the A939 for the climb up into the Cairngorms proper, through the alpine hairpins of Bridge of Brown and the grid system village of Tomintoul, not actually the highest village in Scotland, but can at least boast the Glenlivet estate. A short, steep blast up to the Lecht ski centre at 2090 ft and some photos with the snow and stunning views across the mountain range. Dropping down into the glen I was running too late to take up the Queens invitation of tea and cakes at Balmoral, but another petrol stop just up the road at Braemar after a great run along the River Dee gave a chance for a breather before the road climbed again up to Glenshee at 2132 ft. Dropping down through the Spittal of Glenshee it was a relaxed bimble through leafy lanes until I hit the congested mess of the M90 for the final slog back to Edinburgh. A rude awaking after 2 days of such stunning riding. A final fill up just round the corner of Saltire, back with 2mins to spare and security deposit safely refunded. Such a cracking trip, and I’ll be heading back to the Highlands for sure. Cheers to Sam for composing the blog for us and sharing his experience. What an ace journey he had and, after reading this and seeing the photos, we really felt like we were on that trip with him. So, to keep up with Sam, why not follow his Instagram HERE and if you're into biker tees and accessories, check out his own Brand of clothing, TWO GUN SALUTE!